I always ask my students what they would like to make the first day of class in a survey. I hate teaching the same thing over and over again in exactly the same way….yawn yawn, it gets boring. 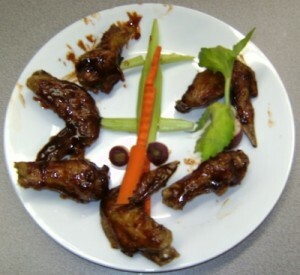 So to change it up, I had one semester where students really wanted to learn how to make Buffalo chicken wings so I substituted cutting up a whole chicken and frying it for this lesson. I love customizing the class to the students even if it means extra work for me! 8.5.1 Demonstrate professional skills in safe handling of knives, tools, and equipment. 8.5.5 Prepare various meats, seafood, and poultry using safe handling and professional preparation techniques. I still show them how to cut up a whole chicken via a YouTube video. I also offer extra credit for any student who cuts one up at home. Simply making the chicken wings is not that hard nor does it take too long so I challenged students to present their Buffalo wings elegantly. Additionally you can have students make blue cheese dressing from scratch. You can also provide a recipe for barbecue sauce if students prefer sweet over spicy wings. 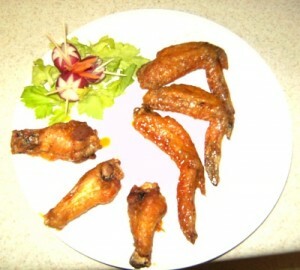 Make Buffalo wings, plate wings elegantly. Work on poultry lab questions.